In applying psychology to the field of politics, the eminent British anthropologist and psychologist W.H.R. Rivers deals with social or collective psychology rather than with the psychology of the individual. This choice presents a number of problems. These include the relation between individual and collective psychology, the concept of a collective or group mind, and the question of how far society can be regarded as an organism. The choice also presents the need to explain the fact that when a number of individuals act together, the product of their combined activity is not the same as what might have emerged from the separate activity of individuals. 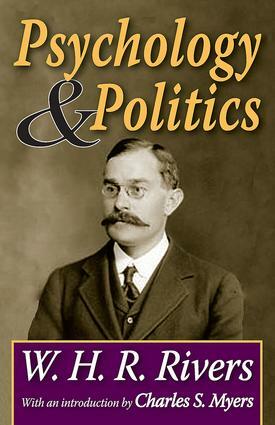 Rivers' belief in the political process prompted him to deliver the lectures on psychological theory that are printed in this volume. Three other addresses are also included in this volume, one on socialism and human nature, another on education and mental hygiene, and a lecture on the aims of ethnography. Rivers considered the relation between psychology and sociology, putting forward the position that the formulation of an adequate science of social psychology lies in the observation of social conduct, including not merely the social conduct of everyday life, but still those forms of it which are subsumed under the headings of religion, economics, and politics, as well as the social institution of language. The social behavior of mankind is capable of being studied as a methodological principle, independently of the psychological basis of behavior. AN ADDRESS ON " THE AIMS OF ETHNO-LOGY"